Fresno State Black Helmet Authentic by Schutt | Sports Memorabilia! 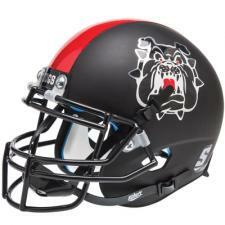 This is the Fresno State Black Helmet by Schutt. It is the authentic Fresno State helmet XP model that is taking the Fresno State fans to a higher level! The helmet design has the silver foil Bulldog on the side with a red tongue and red eyes. On the opposite side is the #13 in silver foil. Down the middle is the red triangular stripe with the green "V" at the back of the helmet. The word "Dogs" is on the front bumper above the facemask in silver foil. This is an awesome looking Fresno State helmet. New logo as of 2013 season.